Dear Readers, I am in love. Ever since Tofu on 7th got a new chef who’s actually from Sichuan Province, in China, they’ve been knocking the vegetarian mapo tofu out of the park. At most Americanized Chinese restaurants the dish is sloppy, sweet, and boring. At Tofu on 7th it’s an incredible dish. 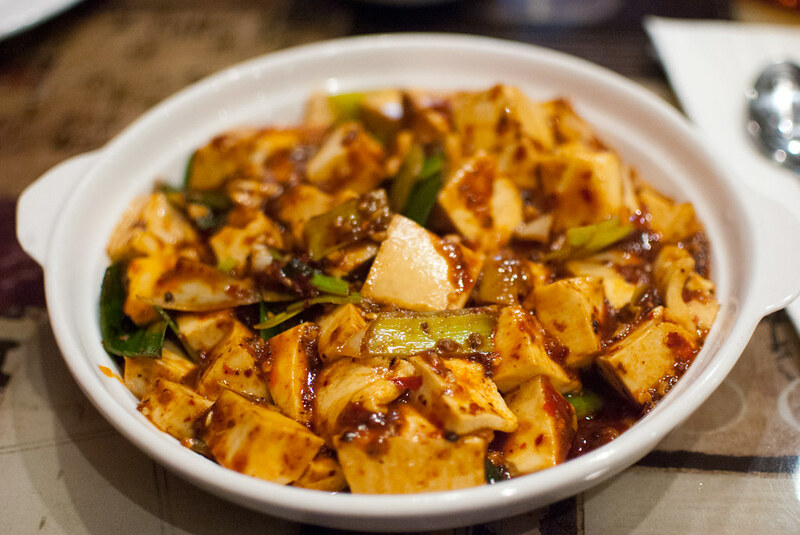 Silken tofu is drenched in chile oil and dried chiles, and sprinkled with Sichuan peppercorns. The creaminess of the tofu is broken up by the crunch of curled green onions. The spiciness of the chiles is offset by the electric numbing sensation of the Sichuan peppercorns. It’s an altogether addictive and captivating plate of food. I eat this dish almost once a week, and it never gets old. By the way, although I try to order brown rice when possible, this dish all but DEMANDS to be eaten with white rice. This entry was posted in park slope and tagged chinese, park slope, tofu on 7th. Bookmark the permalink. Just ordered from Tofu on 7th for the first time last night. I got the vegan protein Triple Delight and cucumber salad app. I have to say, both dishes tasted exactly the same: overwhelmed by chili oil. I had a hard time opening the containers because they were just so slippery. Have you tried other dishes from there since this one? I’m wondering if most things are just seasoned the same. I wanted to love it! I swear!! @molly – i’ve never eaten either of those dishes, but i can see where they might be covered in the same chili oil. one of the great things about the mapo tofu is that it’s also seasoned with fermented black beans, which add a ton of flavor. go for that next time!